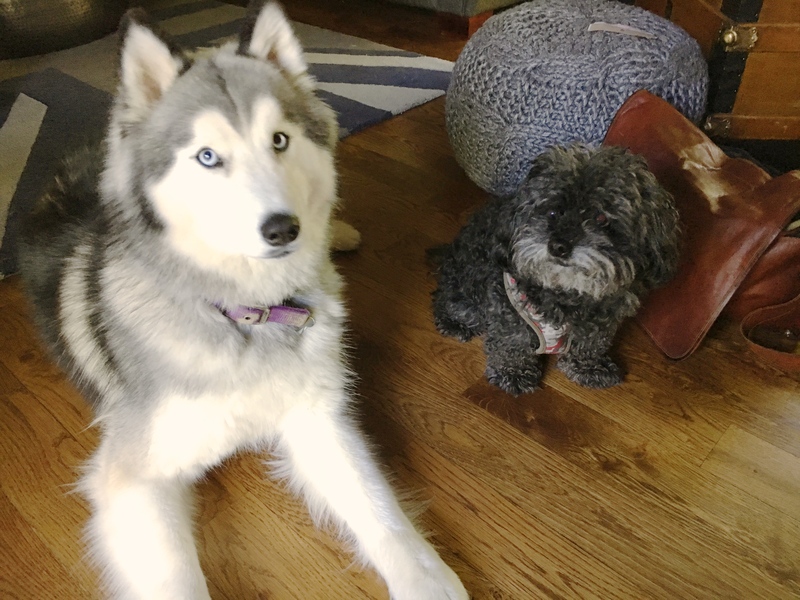 Dakota (left) is a two-year-old female Siberian Husky who lives in Omaha with Gizmo, a seven-year-old Maltese Poodle mix. The dog’s guardians set up this dog behavior training session with me to stop Dakota’s food guarding and both dog’s habit of invading personal space, jumping up on or nudging the humans when they want attention. The dogs met me at the door and took turns trying to jump up on me as soon as I stepped inside. Some of these unwanted dog behavior issues are due to excitement, but the real reason was the guardians hadn’t taught the dogs how to respect boundaries or personal space. This is a pretty common scenario for many dog guardians we work with. As a dog behaviorist, I have found many people never think about teaching their dogs how they want them to act or behave in various situations. Because we don’t articulate what we want, the dog’s are left to figure this out on their own while we try to teach them in the act itself. Frequently this results in unwanted dog behavior issues that cause frustration for both the human and dog. I suggested that the guardians try a new approach when faced with similar situations in the future. The first step is identifying what the dog is trying to accomplish. Once we know that, then the humans can break the activity down into small individual steps and train the dog in the behavior or action they want them to display. Once the dog has that step down, then they can move on to the next step and practice that one by itself until the dog is responding the want they want. The real key to this technique is NOT doing it when the event is taking place. Instead, setting up a simulated scenario allows the human to control the situation and environment, reduce the pressure of a real word situation and put the dog in a position to succeed. This technique can be applied to most activities where the humans identify any unwanted dog behavior. It takes time and patience, but when done correctly, this solves the problem for good. After suggesting a number of rules and boundaries as well as ways to enforce them, I turned my attention to Dakota’s food guarding problem. We call this resource guarding and it can be a very serious issue that results in an actual dog bite if the human pushes too far. I spent a few minutes going over some dog behavior tips that should help reduce Dakota’s feeling that she needs to protect her food in the video below. Its going to be important that Dakota’s guardian goes slow and keeps practicing each step until the dog is calm and comfortable before progressing. If the dog reacts, they moved too far too fast. After we wrapped up the food guarding segment, I went over a few exercises to help the dogs learn how to focus and a leadership exercise to help the humans practice some new communication methods. By the end of the session, Dakota wasn’t jumping up on me, was showing respect for personal space and able to leave a high value meat treat alone even though it was on the floor in the middle of the room. These are not bad dogs by any stretch; they simply didnt know how their humans wanted them o act. Now that the humans know how to communicate what they do and don’t want, it shouldn’t take long to put these unwanted dog problems to bed for good. We wrapped up the session by going over Dakota and Gizmo’s roadmap to success. You can watch it by clicking the video below.